Chandannagar, historically significant town in the realm of District: Hooghly in Bengal, remained witness to a bitter Hindu-Muslim conflict on April 21, 2013, leading to the injuries of several Hindus and deep tension in the vicinity. The crisis erupted when the religious procession of Hindus, brought out to observe RamNavami, was attacked by Muslim radicals, set not to let Hindus live peacefully there. Do Shariah Courts serve Muslim women or portray male chauvinism? Even if the demand of Shariah Court is increasing in Bengal, another reality is also coming to the fore – Muslim women even after moving to Shariah Councils for annulment of marriage, owing to excessive domestic violence or inhuman tortures by their husbands, remain helpless. Many instances prove that albeit they become able to have divorce, the triumph turns out to be a Pyrrhic victory altogether – women are forced to part with their own children as the Shariah Councils never allow any divorcee to live with her children thereafter. This is not any local or regional phenomenon but Muslim women whether in Dhaka or Kolkata or even London do face the same grim reality. Whenever a community gets powerful or pampered ceaselessly one thing gets common – it gets interested in asserting own identity and leaves no stone unturned to attain the objective come what may. Muslim community in India, coddled by secularists relentlessly is at crossroads at the moment and is being perceived to assert its own identity yet again by relying more on the need of introduction of Shariah (moral code and religiouslawof Islam) in the Indian scenario. 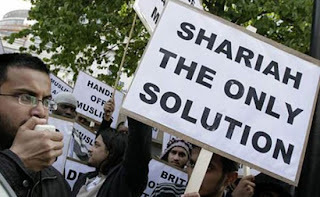 Muslim radicals are raising the demand of the same more strongly than ever before and are being supported by intellectual coreligionists as well. Such a voice was heard of late in Kolkata and it was none except Maulana Khalid Saifullah Rahmani, General Secretary of All India Personal Law Board. He was speaking in an open session of `Tamire Millat Conference’ called by Imarat-E Shariah Bihar, Orissa, Jharkhand and Kolkata Branch on April 14, 2013, at TB Association Hall, Kolkata. Without doubt, there can’t be any better specimen than this to prove how rising Islamic appeasement in Bengal has made Muslim radicals consider that they can outrage code of law wherever and whenever necessary to satisfy their own needs. Radhamoni Bazaar area, P.S. Tamluk, District: East Midnapore, on April 21, 2013, remained witness to a bitter Hindu persecution stemming from Muslim radicals’ defiant endeavors to continue illegal construction. When Hindus protested they were beaten ruthlessly, leading to injury of 12 Hindus among whom 2 are in critical conditions. Yesterday on April 23 night at around 11 pm a mob of cow traffickers supported by local Muslims created a mayhem in the village of Khaspur under Baduria Police Station (North 24 Parganas). They attacked many Hindu houses including that of Shyamal Baidya, Kamal Baidya, Joydeb Mondal, Jagannath Roy, a few Hindu shops including one tea stall of Srikanta Mandal and a local club ‘Young Star’ of the village. Shyamal Baidya's nine month pregnant wife and his aged mother were molested and beaten up by the attackers. They also forcibly took away two mobile phones and other articles from Shyamal's house. Why is there such a vociferous opposition against Hindu Samhati? Both political pundits and experienced activists do assert that any organization undergoes three stages in its life span – they are disdain and negligence, vigorous opposition and recognition (last and final stage). Now if the saga of fiver years of Hindu Samhati (ever since its inception) is considered – the organization is having the second stage or vigorous opposition at the moment. Hindu Samhati took merely three years to go beyond the first stage and only on the fourth anniversary (2012) we had to face immense repression of the state government. When the need is to establish own suzerainty by uprooting adversaries, sectarian strife is not the only option. While on one hand it can lead to an undesired clamor, apparent reactions to it may also hinder the project largely. Silent but more effective measures like violating the legal code stealthily can yield more benefits – this happens to be the latest ploy of Muslim radicals in Bengal against pacifist Hindus who prefer to remain silent till they are injured physically. 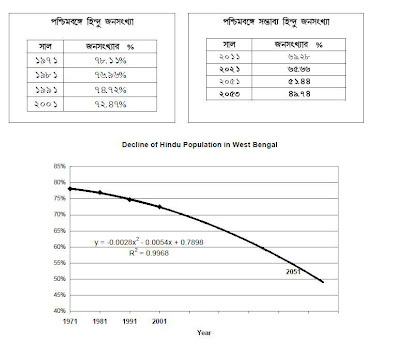 Has Shahbag movement created Doomsday for Hindus in Bangladesh? Hindu persecution in the realm of Bangladesh (erstwhile East Pakistan) has never been less and with the onset of Shahbag movement demanding exemplary punishments of war criminals or accomplices of murderous Army of Pakistan in the 1971 war the same saga has become all time high. Even if the number of slain Hindus has been low, destruction of them (in every capacity) across Bangladesh by Jamaat-e-Islami and other Islamic organizations, if taken into account, may put beasts to shame. Moreover, albeit the mainstream media worldwide has been able to portray a few horrendous developments from February 28, 2013 till date, the larger spectrum of destruction remains hidden yet. What pains more is that the social media or social networking sites have also failed to depict the same meticulously. There is hardly any end to lust of Muslim radicals for Hindu women in Bengal and on April 11, 2013, Mangala Dhara (age 38), wife of Madan Dhara – Hindu individual living in village: Heledwip, P.S. Bagnan, District: Howrah, became the unfortunate victim. The incident occurred when she was busy in mowing the grass in a nearby field; Mohammed Sanjib, local Muslim individual, attacked her from behind and molested her forcefully. However, she could manage to free herself and rushed to the club comprising Hindu youths. The news spread like a wild fire in the village; Hindu youths grabbed Mohammed Sanjib soon and thrashed him as well. But nothing like this can diminish spirit of a Muslim radical like Sanjib. Mangala Dhara, along with Subhash Bhowmick (age 25 and local Hindu youth), went to P.S. Bagnan and lodged an official complaint – No. 767/11.04.2013. What troubles the whole of Bangladesh at the moment is the show of strength of both Islamists and progressives and their uncompromising attitude – both are heading towards a clash – bloody and decisive that will settle the future of Bangladesh or the end of it. This, however unfortunate it is, happens to be the most dominant belief within the Bangladeshi populace and not they fear loss of job or means of livelihood only but many of them have started to consider that harrowing days of 1971 would return soon – they will become stateless people once more. What many of them consider is that Bangladesh, one of the poorest countries across the globe, remains devoid of any industrial infrastructure and global mercantilism accordingly and the months-long conflicts stemming from Shahbag struggle and its anti-thesis is making the country near the permanent destruction. How the district of Howrah in the Indian state of Bengal is turning into a stronghold of Islamic fundamentalism can be ascertained from the torturous experiences of Sushmita Das, Hindu housewife of age 18, wife of Kunal Das and living in village: Nimtala Barwaritala, Nazirgunj I/C, P.S. Sankrail. She was both molested and injured violently on April 9, 2013 at 11 pm by three Muslim radicals, Zafar (age 22) and Jehangir (age 26), joined by another one later. They entered the Hindu household as hucksters or hawkers. When a person gloats at the destruction of others, he is called inhuman or an individual devoid of feeling and consciousness and animation. Any such person is censured severely and is deemed as completely unfit to live in any human society. If you believe so, it’s the time for you to castigate supporters of Akbaruddin Owaisi, rabid Muslim leader, known for disparaging Hindus, their religious beliefs at times and arrested on 8 January 2013 for hate speeches against Hindus. His supporters, at the moment, are busy in rejoicing the terror attack at Boston Marathon on April 15, 2013, Monday in the United States. It is hard to believe that any human being can stoop to such an extent but this is a reality. 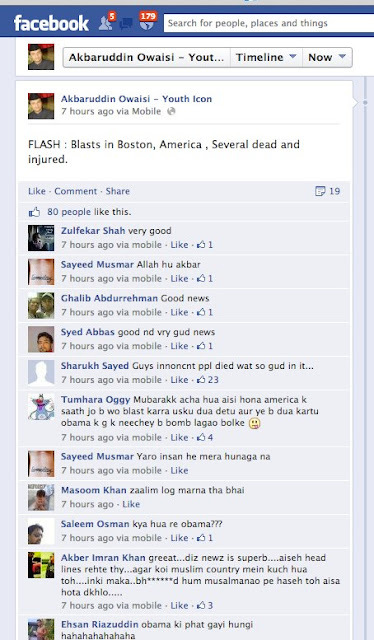 You can have a glimpse of this despicable activity from the screen-shot of Facebook attached with this report. What is the best way to ruin the confidence of any person or community? It is to inflict violent attacks on the most cherished objects of the very individual or community and to break the morale of Hindus, the best way is to assail their venerated temples – a stratagem too well-known to Muslim radicals down the centuries. 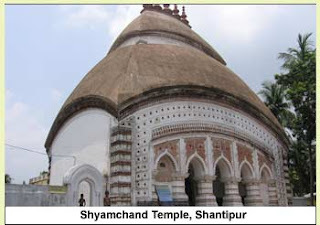 Shyamchand Temple in Shantipur, District: Nadia, of 700 years old, known for its architecture and also for playing a pivotal role in guiding Hindus in the vicinity, to strengthen the intra-community bond has become the latest victim to Muslim radicals and their devilish designs to erase Hindus from the area. 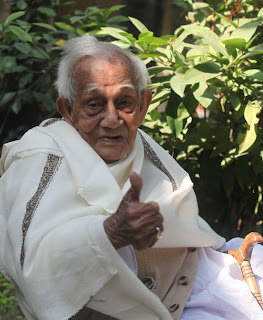 With the death of Benode Behari Chowdhury, a valiant member of Chittagong uprising between 1930-34 and a disciple of Masterda Surya Sen, the connection between Bengali Hindu youths (these days) to their heroic and amazing past has come to an end. Benode Behari Chowdhury was not a mere member of the revolutionary group operating in Chittagong area of then undivided Bengal only but denoted a period when Bengali Hindu youths, influenced by the fiery ideals of Swami Vivekananda to sacrifice themselves at the altar of motherland, did raise a storm to free Bharat Mata from the shackles of British Imperialism also. There were tens of thousands of Bengali Hindu youths like him and each and every daring activity of them indeed limited the existence of Union Jack in India. In the Ketugram Hindu persecution incident of Bardhaman district on 12 April, the Shiv Puja (Gajan) procession of the Hindus were attacked by the Muslims and later forcibly stopped by the police and the puja ritual was left incomplete. Furthermore police barricaded the entire village and disallowed any ingress or egress. It is reported that the whole incident took place at the instigation of Abdul Gaffar, the I.C. of the Ketugram PS, who played a very mischievous and nakedly partisan role. He arrested 4 Hindus : Tapan Sengupta, Mithu Dasgupta, Nadu Hajra, Mithun Dey. 3 Hindus have been injured - Arun hajra, Kheru Hajra, Madhu and 65 year old mother of Naru Modak. Taimur Rahman [Tutul], Panchaayat Pradhan-Ketugram 2, also played a dubious role. Will Islamic fundamentalism rule the roost and destroy Hindus finally? When both Bengal and Assam burn due to Islamic fundamentalism how can the rest of India be far behind. All these are said because the tentacles of Muslim radicalism, recklessly determined to balkanize Hindu-dominated India, is in full swing throughout the nation and with the passing of each day, the vicious stratagem is getting stronger and also being applied effectively. After Nadia, North and South 24 Parganas, now, its time for Bardhaman to experience the true colour of so called religion of peace. Ketugram is a small village under Katwa Sub-division in the district of Bardhaman. The village has 80% Hindu & 20% Muslim population. For centuries, Hindus, in that locality, celebrate the last few days of the Bengali calendar year worshiping Lord Shiva which is popularly known as the Gajon festival. As a part of the celebration, devotees take 5 idols of Lord Shiva for holy shower in the river Ganges at Uddharanpur that is almost 10 km away from Ketugram. On 11th April, 2013 a meeting was held in presence of ADM, SDPO, OC & CI of Ketugram police station where the route of the procession was approved by the administration. It was also decided in the meeting that as there was a mosque en route, the procession should start only after 1.05pm i.e. 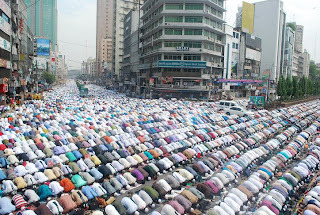 after the end of namaz.